À Contre-Courant (ACC) is an aquatics club created mainly for the gay and lesbian community in the Montréal area. Its statutes state that it is committed to accepting anyone ‘regardless of sexual orientation, gender, ethnic origin, political or religious beliefs, physical disabilities, or HIV status.’ Refusal of any form of discrimination is in fact one of the club’s founding principles. ACC’s activities include swimming, water polo and synchronized swimming. Each discipline is supervised by qualified coaches and the club is affiliated with the athletic federation that regulates its practice (Féderation de natation du Québec, Féderation de water-polo du Québec and Féderation de nage synchronisée du Québec). ACC is also a member of Équipe Montréal, Montreal’s gay and lesbian sports teams association, and IGLA (International Gay and Lesbian Aquatics). Since its creation in 1990, À Contre-Courant has rapidly carved a place for itself in Quebec’s aquatic sports community. Over the years it has gained an enviable reputation for its organization of sporting events. Although many of its members work out mainly to keep in shape, taking part in competitions – as a competitor or an organizer – is an important area of the club’s activities. Moreover, its involvement in the gay and lesbian community and the friendship and solidarity that it helps to foster among its members make À Contre-Courant much more than simply a sports club. Although À Contre-Courant resembles other masters aquatic clubs, its name provides a clue about its desire to respond to a special calling. In fact, it is the only club of its kind in Quebec that focuses primarily on gay and lesbian athletes. ACC’s chosen mission is ‘to promote the well-being of its members through the practice of aquatic activities, to encourage the self-esteem and affirmation of gays and lesbians, to further mutual comprehension and exchanges among individuals and to contribute to raising the visibility of the gay and lesbian community.’ (excerpt from the General By-laws adopted on March 4, 1995). A general meeting is held once a year to elect the board of directors. The board may be comprised of up to nine members and is responsible for ensuring the smooth operation of the club’s activities and the promotion of its objectives. 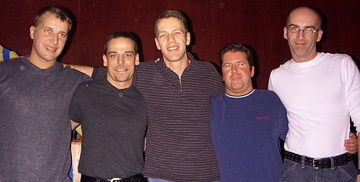 The five founders of ACC: Luc Hurtubise, Yves Leclerc, Dominique Lampron, Sylvain Dugas and Marc Pageau. t was upon their return from Gay Games III, which took place in Vancouver in 1990, that Yves Leclerc and Sylvain Dugas felt the need to form a gay swim club in Montreal. Dominique Lampron (club president for 10 years) soon joined them, and the club was founded on October 27, 1990, under the name Montréal Équipe Natation (M.E.N). The more inclusive current name was adopted on October 22, 1994. The very first training session attracted only eight swimmers. By the end of its first year of existence, however, the club had 60 members. In 1993-94, it became the third largest masters swimming club in Quebec with 88 members. Since then, it has not relinquished its spot at the top of the heap in terms of club size. On August 31, 1999, it reached a peak of 150 affiliated swimmers, making it the largest team in the province. In the beginning, the club’s activities were limited to a single training session per week, on Saturday. Tuesday and Thursday sessions joined the schedule in January 1993, followed by Wednesday in September 1994 and, finally, Monday in the fall of 1998. Water polo made its debut in the winter of 1992. Diving, which had existed informally previously, became official in December 1993. Synchronized swimming was launched in March 1994 and finally, in the fall of 2006, triathlon was added to the mix. In March 1995, the City of Montreal, under whose auspices À Contre-Courant’s weekday training sessions took place at the time, officially recognized the club’s existence. When the municipality pulled out of the management of recreational activities in September 1999, the sessions were placed under the sole responsibility of ACC at the Cégep du Vieux-Montréal. ACC has since acted as a partner to the City. In addition to practicing its sports, À Contre-Courant strives to offer its members a warm and friendly environment with an emphasis on camaraderie. Almost from the beginning, club members have made a tradition of dining out together after their Saturday evening workout. The club also occasionally organizes social and fund-raising activities. ACC demonstrates its solidarity with the gay and lesbian community by taking part in events such as Divers/Cité (Montreal’s gay pride parade) and by organizing the Eau vive swim-a-thon. A tradition since 1996, Eau vive is a fundraiser benefiting organizations that assist people living with HIV/AIDS. À Contre-Courant’s commitment has been recognized in many ways in both Quebec’s swimming community and the gay and lesbian community. Most members of ACC are involved in the life of the club and participate as volunteers in organizing one or another of its activities, thus ensuring that the club can continue to fulfill its mission. Volunteering is really the heart of À Contre-Courant, and the generosity of its members deserves recognition. Imagine for second, if you can, that you are a young Australian woman. You arrive in Quebec in February 1994 and it’s -20°. Australians do not believe in -20°, they think it’s like Santa Claus or the sasquatch – it doesn’t really exist. This particular February, it was very cold. As well, I was trying to learn French. It is very difficult to learn French in Montreal, because everybody speaks English, except when conversing among themselves, and they talk too fast. Because of this, I was homesick for quite a while at first. And then I discovered that it was a gay club. Et samedi, c’est le club gai (on Saturday, it’s the gay club), explained Jean-Yves. It’s what?! Had I really understood? Did gay mean the same thing in French as in English? You can imagine me with my eyes and mouth wide open. The idea of a gay sports club was completely new to me. I had no idea that there was a gay community outside of bars, saunas and AIDS organizations. Afterward I was relieved that Jean-Yves was heterosexual, because I was so surprised. Did it make any difference to me? Not really. It’s quite clear that many members of the team are gay, so knowing that the club is officially gay changes nothing. Perhaps if I had been aware of that in the first week, I would have looked for another club, thinking that it wouldn’t be for me (I had my own stereotypes, like everyone). I’m glad that I didn’t know because I would never have found another group as nice as this one. I think that one of the reasons that À Contre-Courant is such a good club is that its main objective is participation and a sense of community rather than winning competitions. And now I understand the significance of Dominique’s first question to me: ‘How did you find out about the club?’ (Fugues or the City of Montreal?). I’ve even had occasion to ask the same question. I think it’s very funny that I was a member of a gay club for nine months without knowing, and I tell the story often. It doesn’t take me much to talk about what an extraordinary club (in the best sense of the word) I swim with. My water polo club is still the most important thing for me in Canada, even more so since I began swimming [competitively] as well. In June, I’m going back to Australia, and I have a dilemma: should I look in the gay community for a water polo team? I don’t think so. I think you are unique. When I leave, I will miss two things in Montreal: À Contre-Courant and bagels. So when you come to visit me, don’t forget to bring me some! But even sans bagels, I look forward to seeing you anyway!